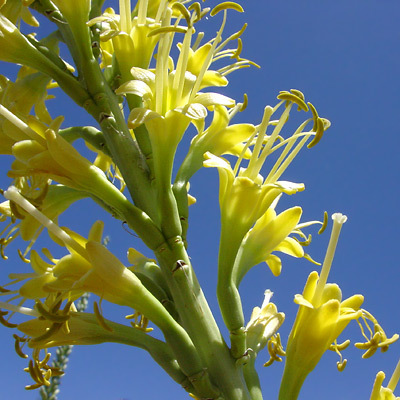 Description: The 6-segmented, tubular flowers are 1 inch (2.5 cm) wide, 2.5 inches (6.4 cm) long, and on tall, narrow, unbranched flower spikes. 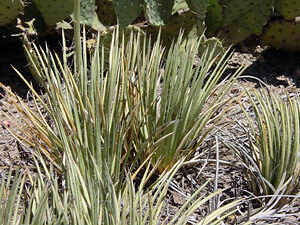 The plants die after flowering and setting seed. The leaves are in a basal rosette and are narrowly linear, green to yellow-green in color, tipped with a sharp spine, and have slender, curling fibers at the margins. These plants are clumping and may form large colonies. Even though it is an Agave, its narrow leaves, fibrous leaf margins, and lack of marginal spines give this plant a Yucca-like appearance. Because the leaves are at shin level and are tipped with a sharp spine that can easily pierce your leg, be very cautious in grassy, upland areas (where these plants grow) because they may be hidden in the grass. Legal Status – Protected Native Plant (Salvage Restricted). Agave schottii var. treleasei is also Highly Safeguarded.